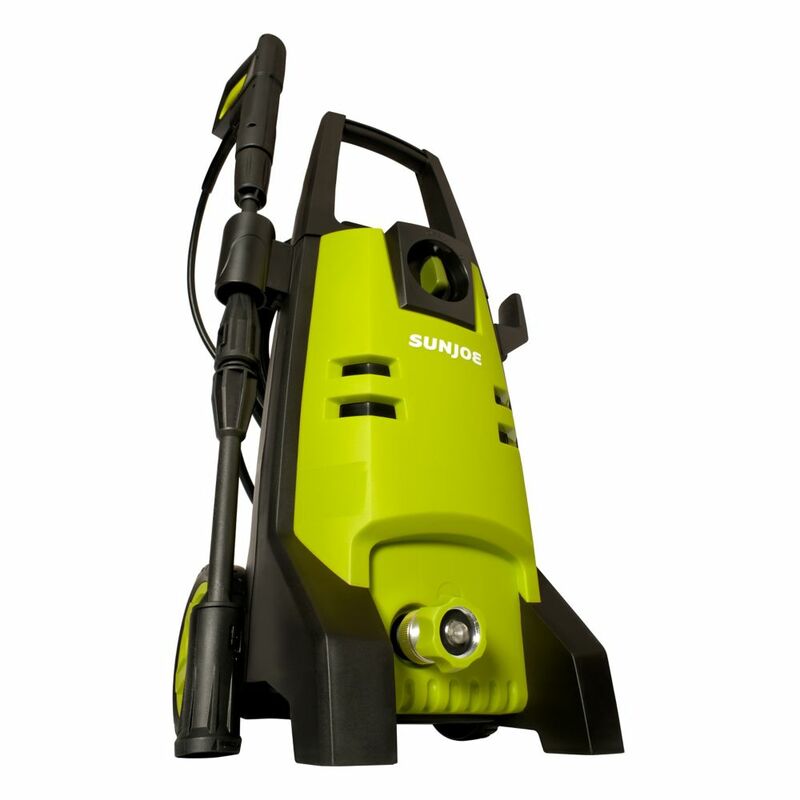 Packed with 12 Amps of pure cleaning power, SPX1500 delivers a might blast - up to 1740 pounds of pressure per square inch and 1.59 gallons per minute - to demolish every last bit of dirt and get really clean, really fast. Simply twist the adjustable nozzle to go from intense jet to gentle spray and watch Sun Joe make light work of mildew, grease, oil, tar, mud, rust and more! And you'll always clean smarter, not harder with the SPX1500's built-in Total Stop System designed to save energy and prolong pump life. Tackle your toughest cleaning tasks with ease and Go With Joe. The new Follow Me is equipped with oversized rear wheels and front mounted casters, making it highly maneuverable eliminating the need to constantly lift and move the pressure washer while you clean. The Follow Me also features the Karcher Quick Connect System on the trigger gun and on all hose connections, simply push and click into place. Since the accessory wands store conveniently on the unit near the onboard detergent tank, everything you need to clean will always be within reach. The Follow Me takes Karcher to the next level of cleaning. Pressure Joe 1740 PSI 6 LMP 12 amp Electric Pressure Washer Packed with 12 Amps of pure cleaning power, SPX1500 delivers a might blast - up to 1740 pounds of pressure per square inch and 1.59 gallons per minute - to demolish every last bit of dirt and get really clean, really fast. Simply twist the adjustable nozzle to go from intense jet to gentle spray and watch Sun Joe make light work of mildew, grease, oil, tar, mud, rust and more! And you'll always clean smarter, not harder with the SPX1500's built-in Total Stop System designed to save energy and prolong pump life. Tackle your toughest cleaning tasks with ease and Go With Joe. Pressure Joe 1740 PSI 6 LMP 12 amp Electric Pressure Washer is rated 4.3 out of 5 by 45. Rated 5 out of 5 by Linz from Customer service was outstanding! I received a product (pressure washer) that had parts that were damaged. I sent emails and pics that showed the damage to Customer Support. They were very responsive, assessed the damage, and sent me a new unit and a return shipping label. Totally satisfied customer! Rated 5 out of 5 by Ryan from Did a great job cleaning my driveway, sidewalks and house.... Did a great job cleaning my driveway, sidewalks and house. I’d definitely recommend it for jobs like that. Rated 5 out of 5 by James from The sun Joe performance was excellent. Did my sidewalks and... The sun Joe performance was excellent. Did my sidewalks and driveway with the pressure washer had no problem with the sun Joe it was easy to work with. Rated 4 out of 5 by VeeM from Light weight. Did a good job!... Light weight. Did a good job! Rated 4 out of 5 by DGonzo from Great little pressure washer. I mainly use it to clean... Great little pressure washer. I mainly use it to clean my truck and dirt bikes. Works great around the house to though. I also purchased the sun joe foam cannon to go along with the pressure washer for the truck and bikes and what an awesome product also! Rated 5 out of 5 by Lzrdoc from Works as advertised The product was easy to assemble, and worked as advertised immediately. I have used it for pressure washing a pool that was just emptied, and it really got out a lot of the dirt that I did not know was there. It also has worked well on patio furniture. It is compact and easy to store, as well as easy to move around. It is just what I was looking for. Rated 5 out of 5 by Keeva from great product Works really well. Only downside is that the handle does not extend requiring one to bend quite a bit when moving the machine as one works.